Scratch River Telegraph Company is a band based out of Wise, Virginia, and features T-Bone on vocals, guitar, and harmonica; Joel Sprinkle on bass, guitar and backing vocals; Aaron Helbert on drums and percussion; and Lloyd Tomlinson on bass, guitar, and backing vocals. 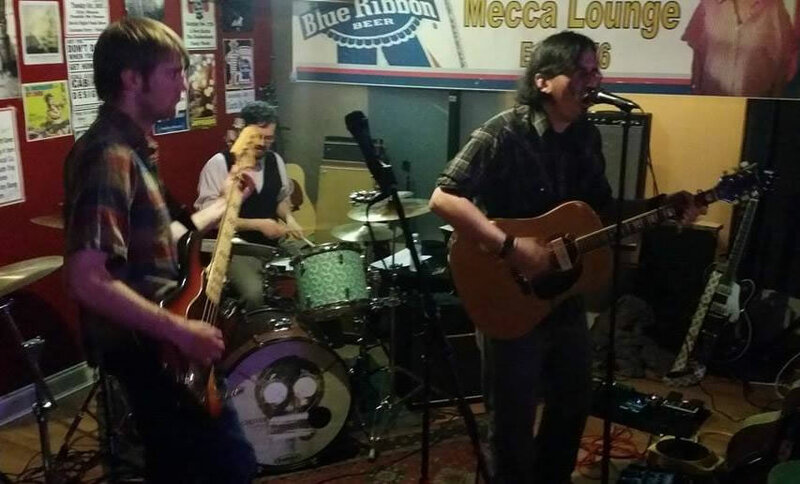 Though Scratch River Telegraph Company has the characteristics of a rock n’ roll band, their roots go much deeper than that. They draw inspiration and musical elements from blues, folk, rockabilly, and even country. Their influences range from old bluesmen such as Leadbelly and Son House, to country musicians like the Everly Brothers, to rock groups like the Replacements, Pixies, and the White Stripes. Storytelling is just as important to the songs of Scratch River Telegraph Company as the music itself. They share stories of loss and tragedy in songs such as “The Flood” and “She Never Left a Note,” tales of crazy times as heard in “Wild One,” and warn of the dangers of living too fast in tunes like “On the Run.” Their two albums, Forty Days and Good Evening Friends & Strangers, are full of all of this and more. Scratch River Telegraph Company also enjoys playing the occasional cover, with songs like “Circles” and “Super Bon Bon” by Soul Coughing, “I’m Gonna Be (500 Miles)” by the Proclaimers, “The One After 909” by the Beatles, and “Hotel Yorba” by the White Stripes. To book Scratch River Telegraph Company, call (423)677-3741 or email us at scratchrivertelegraph@gmail.com.